In this video Caleb talks about the importance of good headphones and why he likes the Senal headphones for monitoring audio. NOTE: Sorry about the poor lighting and grade, banged this video out before a trip and didn’t have much time to work on it. You will pick up on things you would have never heard on your apple earbuds. Studio headphones are designed to help audio techs hear things that other people aren’t interested in listening for, such as wind noise, airplanes etc. 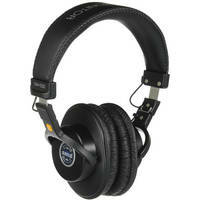 Looks like a Sony MDR 7506 copy..
Just thinking the same : a clone of my Sony 7506s….. I was going to get the Audio Technica ATH-M50 (on sale today for $99 at Amazon) but you convinced me to go with the Senal – 1000. Things I like about the Senal over the Audio Technica: 1-Detachable cord, 2-two different length cords are provided, 3-$30 cheaper. I’m a little confused about the difference in sound that you talked about. It’s my understanding that the ATH-M50 is has a pretty flat EQ curve which makes them good monitors. Just wondering what the difference is. I also wonder how the Senal sounds for general music listening. The only other unknown is the durability of the Senal phones. The ATH-M50 has been produced for years and have been shown to be durable whereas there isn’t much info on the Senal phones so I’m going to trust you on this one Caleb!